Weight loss can start with a healthy diet and an intense cardio plan, we all know that. But don’t factor out those low-intensity workouts just yet. Yoga, for example, can help, too. A new at-home yoga DVD lead by NYC-based yoga instructor Colleen Saidman, takes users through three 20-minute intervals of yoga poses that help promote weight loss. Weight loss can start with a healthy diet and an intense cardio plan, we all know that. But donât factor out those low-intensity workouts just yet. Yoga, for example, can help, too. A new at-home yoga DVD lead by NYC-based yoga instructor Colleen Saidman, takes users through three 20-minute intervals of yoga poses that help promote weight loss. SaidmanÂ fell in love with yoga after attending a class in 1987, and now, 26 years later, she celebrates the launch of her Gaiam fitness DVD, Yoga for Weight Loss (Amazon; about $12). I took a class with Saidman in NYC, but also tried her DVD. 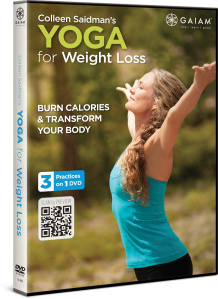 âDVDs are a great way to start one's weight loss via yoga,â Saidman says. The 60-minute video focuses on a holistic approach to weight loss, and encourages a balance of the mind, flexibility, and strength exercises that may help burn calories. She uses traditional yoga moves that focus on slower breathing and more thinking, and I felt like she held poses longer, which was great. In fact I felt the best I've felt after a yoga session in terms of feeling energized. I consider myself an advanced beginner when it comes to yoga, and I think this DVD would work for anyone interested in losing weight. The workout even provides poses for specific hormones, such as a shoulder stand for the thyroid or headstand for pituitary because overactive or underactive hormones can contribute to overweight and obesity issues.